"Something's always happening in Hollywood! To some people - we'll even go so far as to say most of us - it's all synonymous with fantasy. But pull up an exclamation point while we show you the pictorial record of a Hollywood party that was strictly Turnip Corners or Painted Post, or even as you and I would plan it. 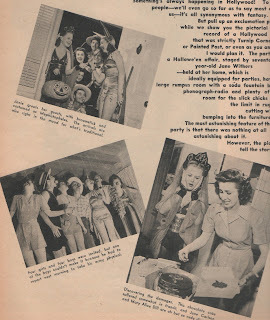 The party was a Hallowe'en affair, staged by seventeen-year-old Jane Withers - held at her home, which is ideally equipped for parties, having a large rumpus room with a soda fountain bar, phonograph-radio and plenty of room for the slick chicks to go the limit in rug-cutting without bumping into the furniture. The most astonishing feature of the party is that there was nothing at all astonishing about it. However, the pictures tell the story." Caption 1: Janie greets her guests, with broomstick and costumed as Mephistopheles. The arrivals are also right in the mood for what's traditional. 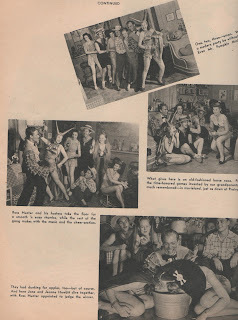 Caption 2: Four girls and four boys were invited, but one of the boys couldn't make it because he had to report next morning to take his army physical. Caption 3: Discovering the damages. This chocolate cake suffered somewhat in transit, and June Carlson and Mary Alice Dill are oh but so vedy dismayed. Caption 1: So much depends on the viewpoint, we always say! Jane gives the impression of being so charmed by Dave Street. His hat, mebbe? Caption 2: Identifying from left to right: Jane, Mary Alice, Jeanne Howlitt, Eric Sinclair, and Street; back row, Ross Hunter, June Carlson. Caption 3: Distaff side of the party pitches in to fix dainty little morsels that pass for chow at such affairs. And who says it ain't good? Caption 4: We take you behind the bar at the soda fountain to show you that there is nothing phoney about this set-up. The bar has all the flavors and Jane knows all the recipes. Caption 1: One, two, three-umps. What would a modern party be without a Congo? Even Mr. Pumpkin thinks it's fun! Caption 2: What gives is an old-fashioned horse race. Proof that the time-honored games invented by our grandparents are still much remembered - in movieland, just as down at Prairy Corners. Caption 3: Ross Hunter and his hostess take the floor for a smooth 'n easy rhumba, while the rest of the gang makes with the music and the cheer-section. Caption 4: They had dunking for apples, too - but of course. And here Jane and Jeanne Howlitt dive together, with Ross Hunter appointed to judge the winner. Caption 1: Comes next a game of musical chairs, done just the same way that we ordinary folks do it. And you see now what we meant, saying parties like this can't really get going without lots of space. Caption 2: Hail and farewell, with a very feminine squeal for a last bit of scarestuff about witches and goblins. Had a nice time kids? Well then, thank the lady! Caption 3: The evening ends with a Hallowe'en joke played on Eric Sinclair - his family chariot gets soaped up, but pullenty! 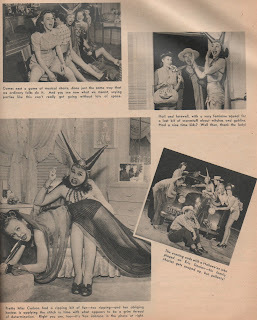 Caption 4: Pretty Miss Carlson had a ripping bit of fun - too ripping - and her obliging hostess is applying the stich in time with what appears to be a grim thread of determination. Right you are, too - it's Van Johnson in the photo at right. Halloween is one of my favorite holidays and even as adult I still like to get dressed up in costume and celebrate. Although, this year I still have no idea what I will be and time is running out! Do you have any Halloween traditions, plans, costume ideas? Right now there is a battle going on in Los Angeles. It's a stadium war. 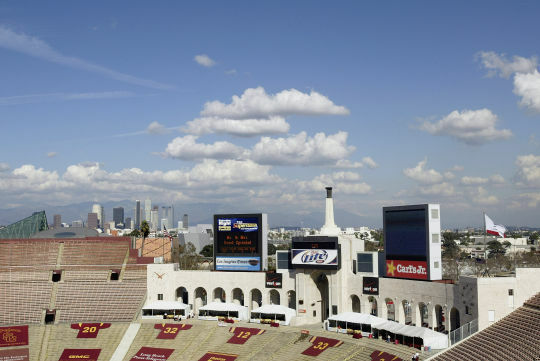 There are a few competing developers out there that each think they have the best plan to build a new stadium in Los Angeles and bring back an NFL football team. Whichever plan wins out, I just hope that the ghost of Charlton Heston is looking over the stadium on the day some psycho decides to attend the game and start picking off people with a sniper rifle. Two-Minute Warning (1976) takes the basic idea of the earlier Peter Bogdanovich film, Targets (1968), in that it has a sniper who sets out to shoot innocent people in a public place. In Targets the shooter plants himself on top of an LA gas tank and starts shooting people driving by on the freeway. 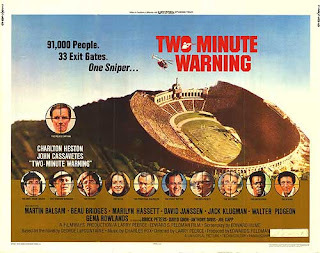 In Two-Minute Warning a shooter hides at the top of an LA football stadium ready to shoot players and fans attending a big championship game. The biggest difference between the two films is that Targets has a real feeling of suspense, whereas Two-Minute Warning feels forced and cheapened by an all too familiar disaster film formula. And of course, 1970s disaster film king, Heston, is there to save the day. If you like the disaster film genre, you will probably find some value in this film. It's also worth watching for the Los Angeles filming locations and the great cast: Heston, John Cassavetes, Martin Balsam, Beau Bridges, Jack Klugman, Gena Rowlands, Walter Pidgeon and a few other great characters. Opening scene looking over the stadium. The football teams in the film are fictional but the Los Angeles team wears the same colors as the University of Southern California Trojans: Cardinal Red and Gold. Below is a screenshot of the stadium filled with fans in their red and gold colors. 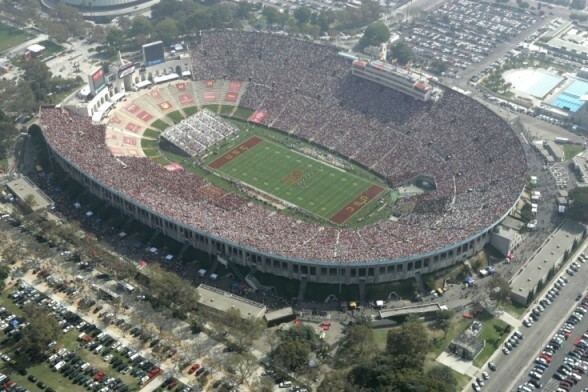 The Memorial Coliseum is the location of the championship game. Martin Balsam & Charlton Heston spy a sniper on the Coliseum tower. 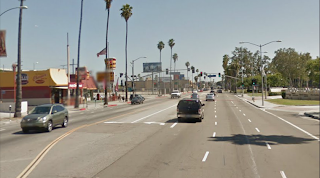 S. Figueroa Street at W. 39th Street. Coliseum in background. 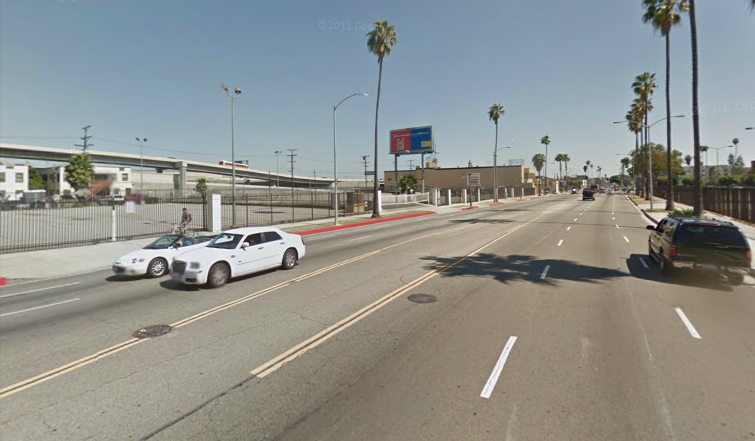 S. Figueroa St. at 39th St. as it appears today. Beau Bridges and family picnic in front of the Coliseum. At the beginning of the film the sniper, standing from a hotel balcony, shoots a bicyclist riding in the distance. We don't really get an explanation why he shoots the cyclist, but maybe he's warming up before going to the stadium to shoot more people? The hotel location is what is now known as the Hotel Angeleno in Brentwood, located at 170 N. Church Lane. 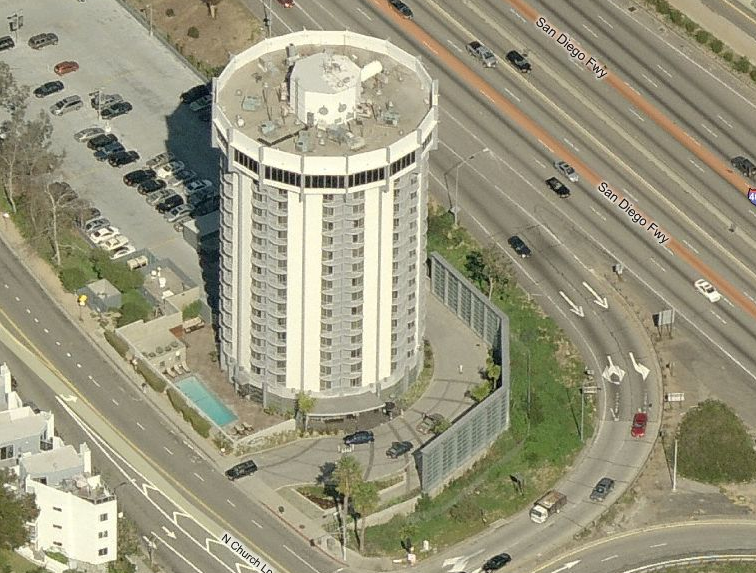 The hotel is right next to the 405 freeway and Sunset Boulevard, the heart of the "Carmageddon" construction that has been taking place. Hotel Angeleno as seen in Two-Minute Warning. 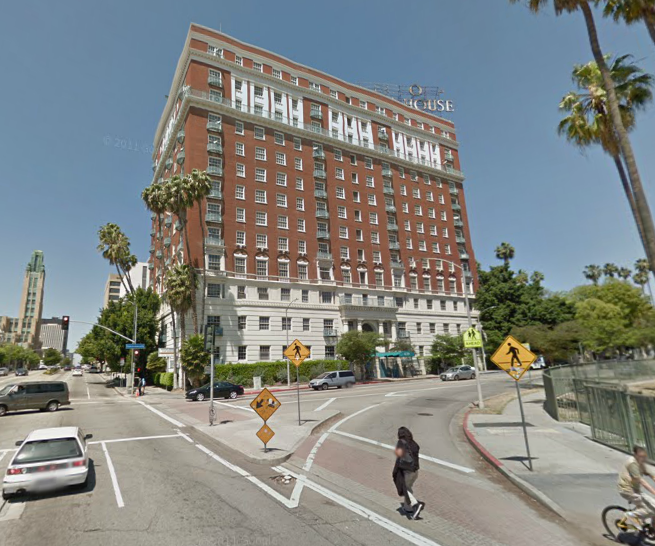 The Hotel Angeleno as it appears today. The sniper stands from the hotel balcony and shoots a bicyclist riding down N. Thurston Circle in the neighborhood directly across the 405 freeway. 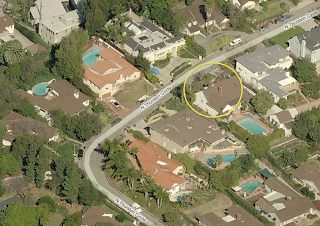 The building with the two chimneys, see inside the yellow circle, is the easiest building to identify. N. Thurston Circle as it appears in the film. N. Thurston Circle as it appears now. A cyclist is shot at the corner of N. Thurston Circle and Thurston Pl. N. Thurston Circle and Thurston Pl. as it appears today. The sniper on N. Church Lane in front of Hotel Angeleno. N. Church Lane as it appears today. 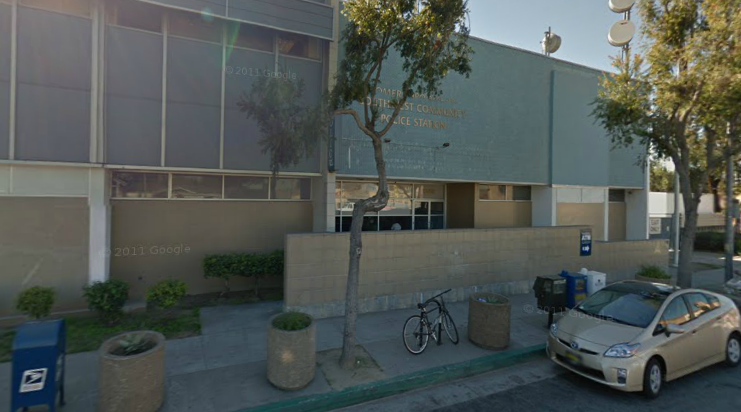 The Los Angeles Police Department Southwest Station. Police Station located at 1546 W. Martin Luther King Jr. Blvd. Below the sniper is driving from the hotel to the stadium located downtown. 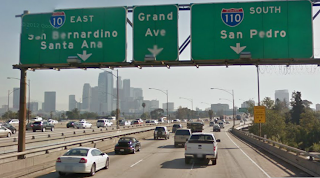 He is driving down the 10 freeway where it crosses S. Union Avenue. It's interesting to see how much the skyline has changed on the left in about 36 years. 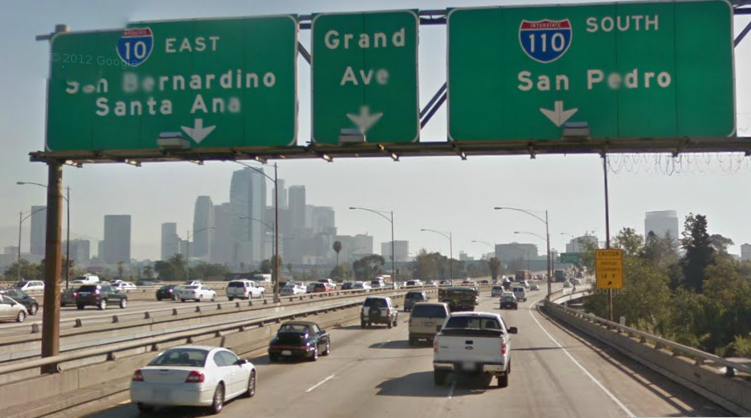 The sniper drives down the 10 freeway. 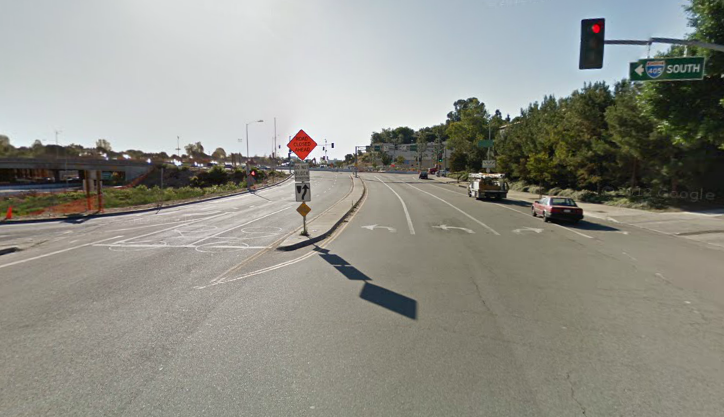 The 10 freeway where it crosses S. Union Ave. 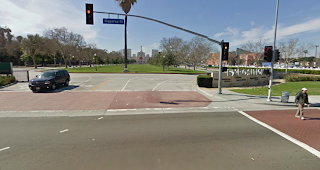 Many of the people that have traveled to attend the big championship football game stay at the Sheraton Town House located at 2961 Wilshire Boulevard. The Sheraton Town House as seen in the film. The Sheraton Town House as it appears today. In the scene below, one of the hotel guests is entering a taxi in front of the hotel entrance on S. Commonwealth Ave. 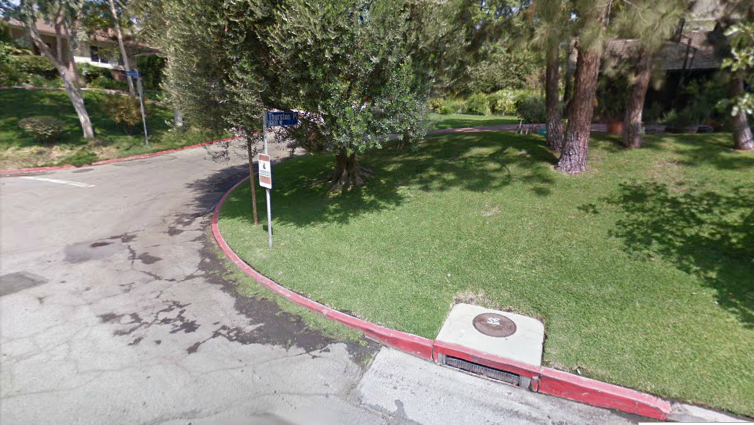 This is the same spot where in the film Donovan's Brain (1953) actor Lew Ayres is seen getting into a car. Also, peeking in the distance is the First Congregational Church, the church James Mason attends in the film Bigger Than Life (1956). A hotel guest leaves the Sheraton Town House. In front of the Sheraton Town House on S. Commonwealth Ave.
Jack Klugman is hung out of the Sheraton balcony. First Congregational Church is in the background. The First Congregational Church. Commonwealth Ave. at 6th St.
Gena Rowlands and her husband fly into Los Angeles to attend the championship football game. 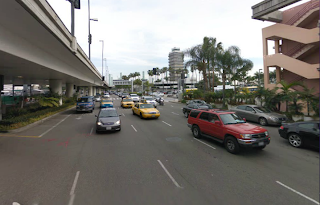 They fly into Los Angeles International Airport, LAX, located at 380 World Way, Los Angeles. LAX Airport as seen in Two-Minute Warning. Below the sniper is almost to the Coliseum. 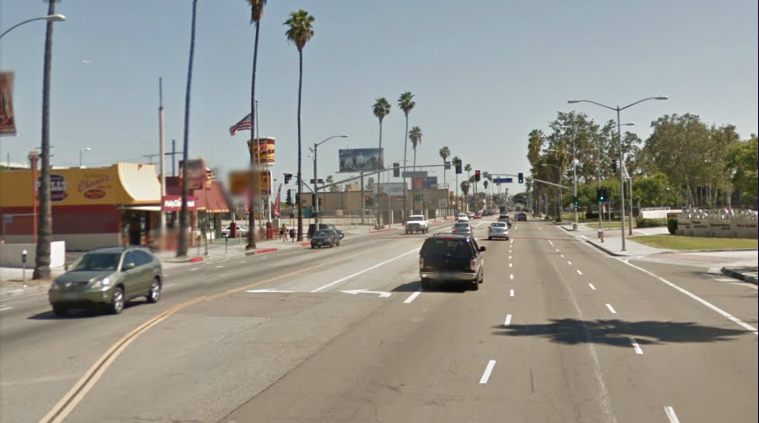 He is driving down S. Figueroa Street near the intersection of 39th Street. In the distance you can see what looks like an old Kentucky Fried Chicken sign in the film but is now the site of Chano's Drive-In. 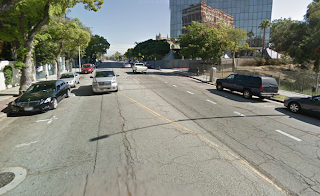 S. Figueroa St. near 39th Street. 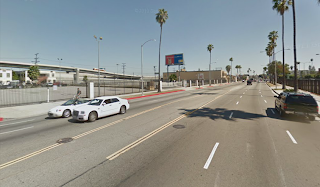 S. Figueroa St. near 39th Street as it appears today. The sniper drives one more block down Figueroa and pulls into a parking lot across from the Coliseum. 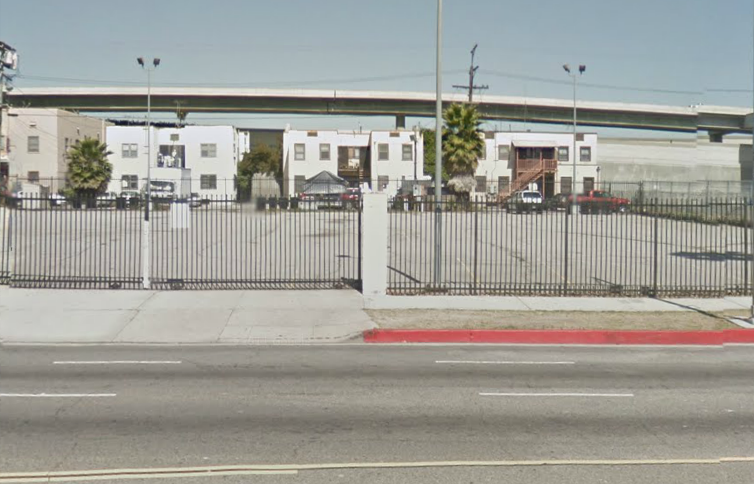 Sniper drives near 3937 S. Figueroa Street. 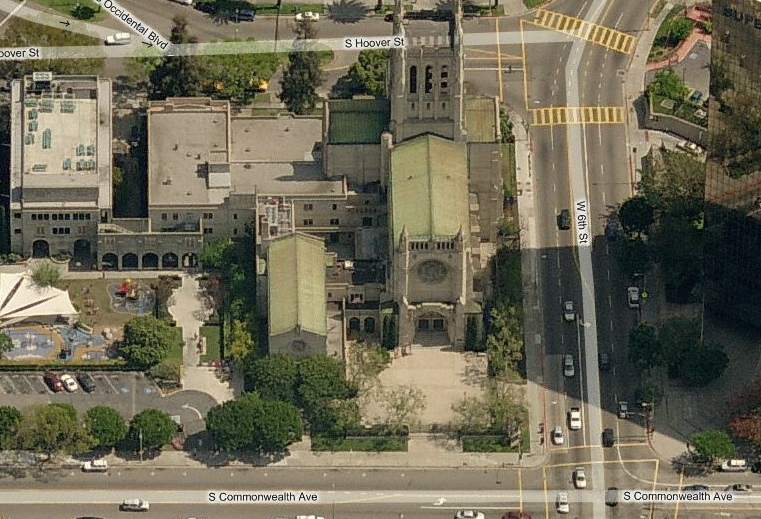 The sniper pulls into the parking lot at 3937 S. Figueroa. 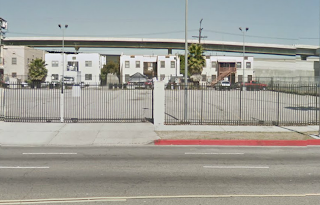 The parking lot at 3937 S. Figueroa Street. Two-Minute Warning is currently available for streaming on Netflix and as an Amazon Instant Video. It is also available on DVD. To see the Los Angeles Memorial Coliseum in a 1930s football themed movie, check out this previous post on the film locations for College Coach (1933). 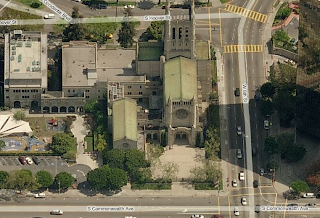 Unless otherwise noted, images (c) Google 2012, (c) 2012 Microsoft Corporation Pictometry Bird's Eye (c) 2012 Pictometry International Corp (c) 2012 Nokia, (c) Universal Pictures.